One of the biggest challenges as vegans is finding restaurants that cater to our special diet. We have to say we are lucky to be living in a city like Montreal, that is pretty open-minded to folk like us. In this, you’ve got: grilled tofu, shredded carrots, beet, and red cabbage, daikon, sprouts, organic brown rice, and their famous Dragon Sauce (sesame-based; can’t say much else!). 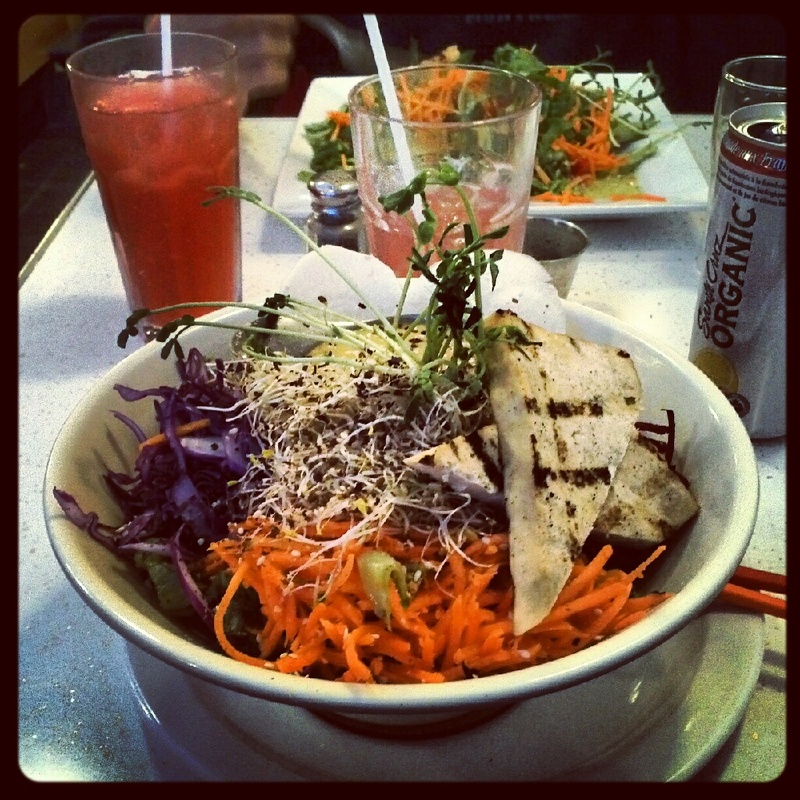 The bowl is HUGE and it’s only $11.95, and I promise you that you will leave the place full. In a future post, we will talk about their delicious fresh chapati bread with veggie butter (my favourite snack!) and amazing desserts. We’ve been faithful customers of this small restaurant ever since we moved to NDG and these guys never let us down. Of course, they offer non-vegan items on their menu but we can tell you that the veggie-friendly stuff we’ve had here was nothing short of amazing. If you tell them in advance, they can make “butter tofu” and replace the cream by coconut milk. I wish I saved the photo, cause this was even better than when I’d have butter chicken! 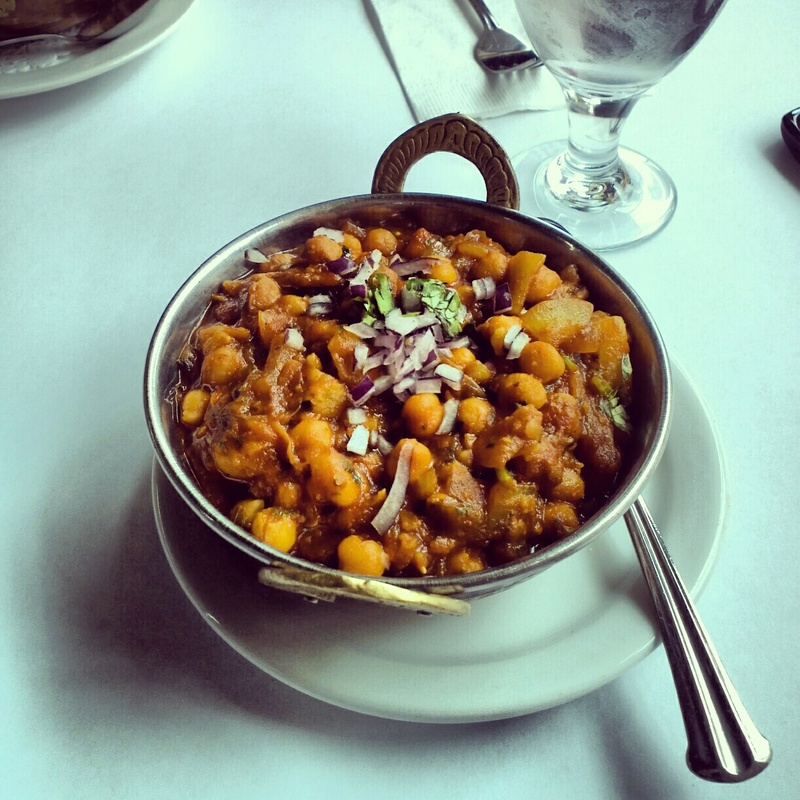 Our new favourite meal from this restaurant is called Chana Masala, and it’s basically chick peas and potatoes in a tasty curry sauce. With a little bit of raw red onion on top, this was just amazing! Oh and it’s ridiculously cheap. You can get a lot for $20 for 2 people. They have amazing veggie samosas! This is the very place I had my first date with my now husband, and it will always have a special place in my heart. The entire restaurant is vegetarian, fair-trade and organic, and you can easily get a vegan meal by removing the cheese or replacing it by something else (sweet potatoes or guacamole). My favourite thing to get there is the Sweet Potato Burrito (minus the cheese of course ;)) and when in season, their soups are to kill for! It’s also quite affordable when you think that it’s all organic and fair-trade, and taxes are included in the price. No photo unfortunately! Family-owned Italian restaurant in NDG, where you are always greeted nicely by an energetic elderly woman. She’s adorable. They have amazing pasta and salads! I do not have a photo of food to show you for this one, but it’s quite good and inexpensive! There are other restaurants we have yet to try… We will post more restaurant reviews as we try new places! Stay tuned!